Given the propensity for front page news to be all about disasters, you might be surprised that this is my mental starting point for today’s Sepia Saturday theme. You see it was the one and only time I’ve made the front page, and in my first term of high school no less. One way to get noticed I suppose. 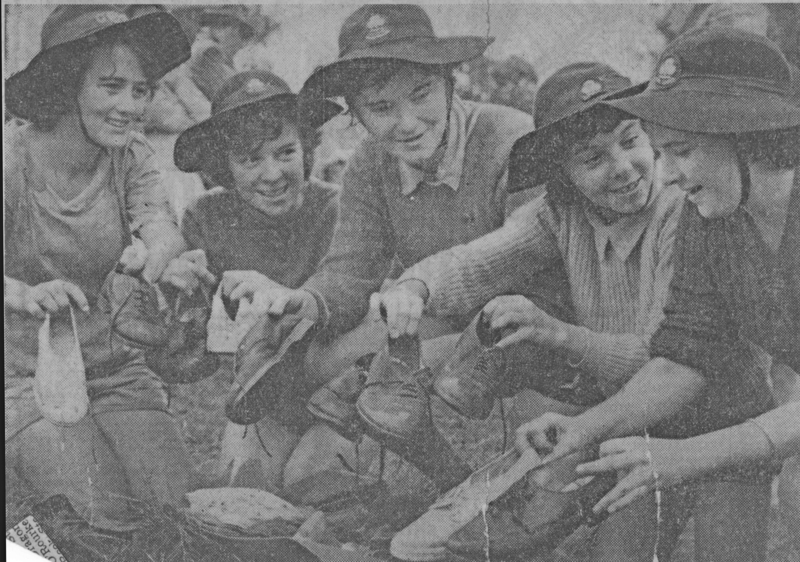 I’d been in Girl Guides since 1960 and passed my camping test for the first class badge on 6 June 1961…coincidentally Queensland Day. We were transported to these camping adventures by an old three-ton truck, probably an old army vehicle. Guides plus camping requirements were piled in the back tray and off we went. Can you imagine that being allowed today? I remember going to a farmer’s property on the far edges of Brisbane where we erected those big cumbersome tents typical of the era. Digging latrines and putting up hessian-screened bathing areas was also part of the fun. Bath time involved those big round metal tubs and the toilets were dirt ditches. Each day we’d get fresh milk from the farmer, or more accurately, his cows. No nonsense about pasteurisation either. Meals were cooked in large army dixies. We’d swim in the very chilly creek and hope not to encounter any eels, water snakes etc. At night we’d have a huge campfire and sing songs. The first time I went camping with Guides my parents came out for a day visit. How that happened I’m not sure – they certainly weren’t the only ones and as they didn’t have a car, they’d have had to come with someone else. I remember I was a little homesick but so were they because for the first time the nest was empty. Then a few years later, over the May school holidays, we went to a different site. This one was on a rise, with a dry creek-bed on one side and a small creek on the other. 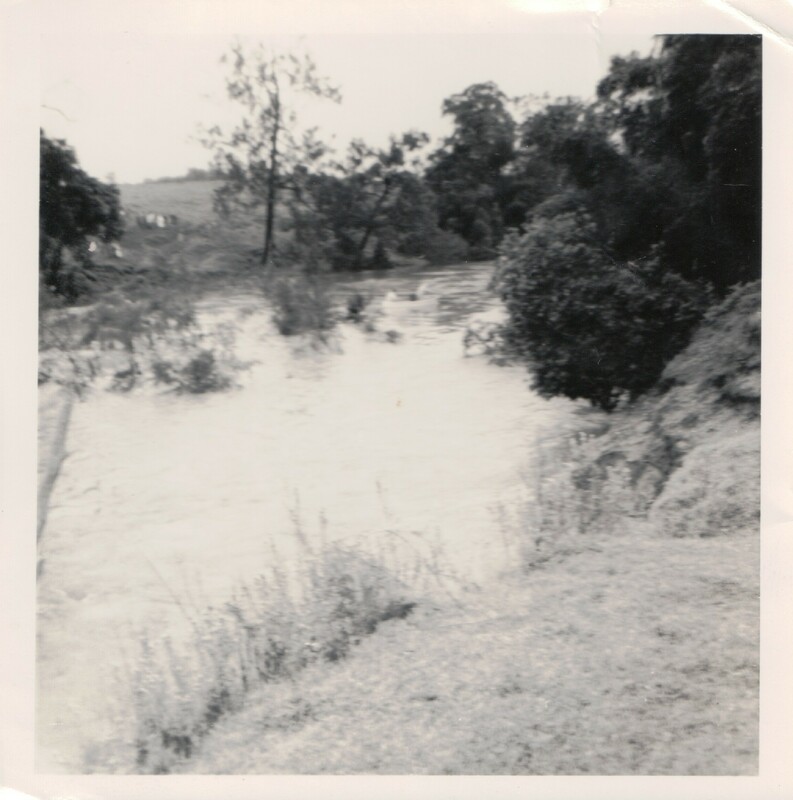 Overnight it rained, and rained, and we woke up to a raging creek all around us and no hope of getting off our new island. As an adult I can only imagine the anxiety and decisions the leaders had to make. You can read the whole exciting story in the linked post I wrote a while ago. Suffice to say, thanks to the Water Police, and a courageous Guide, we made it home safely and found ourselves on the front page of the local newspaper the next day. 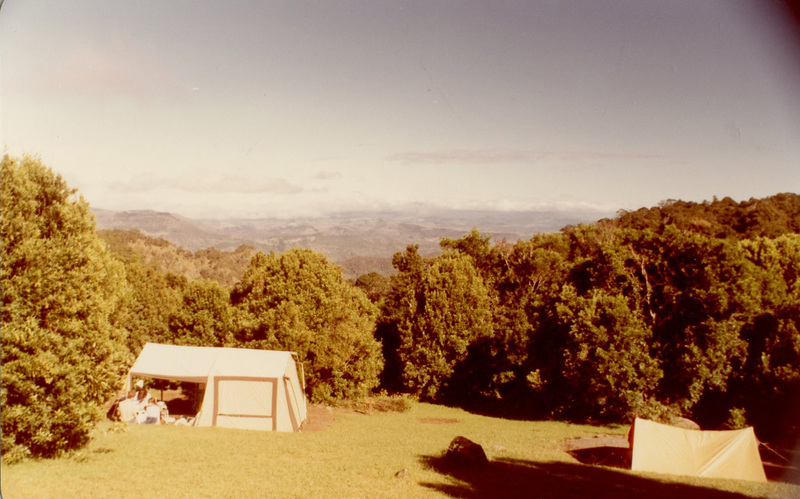 There was no opportunity for holiday camping in Papua New Guinea, at least as far as I know, so it wasn’t until the early 80s that we introduced our own trio of little campers to holidays under canvas. This time we had been invited to join our neighbours on a camping trip to Hastings Point in northern New South Wales. Over the years our family had many great adventures there, and you can read a little about them by clicking here. 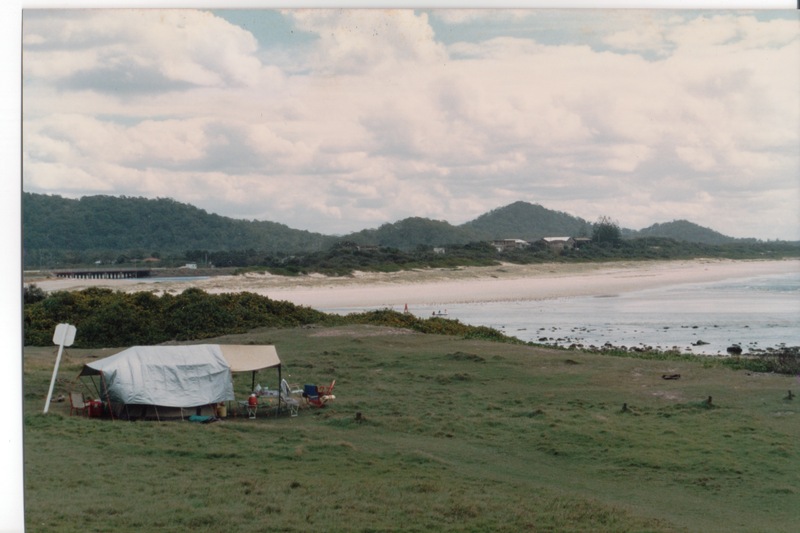 Camping in splendid isolation with a view of the sea…that’s our tent. The photo above (on a grey day) is of our favourite spot overlooking the creek where it joins the surf and the Pacific Ocean. It was always an anxious moment until we crossed the bridge and checked no one had usurped “our” tent site! The next chore was to check out the changes in the creek’s path and whether the pelicans were “in town” or not. In our energetic moments we’d explore the marine park among the rocks, go swimming (convincing the girls not to swim to New Zealand), or have a game of cricket , or just loll around reading a book. The wind could be pretty fierce there and by the time this tent was retired there was nary a straight pole among the collection. 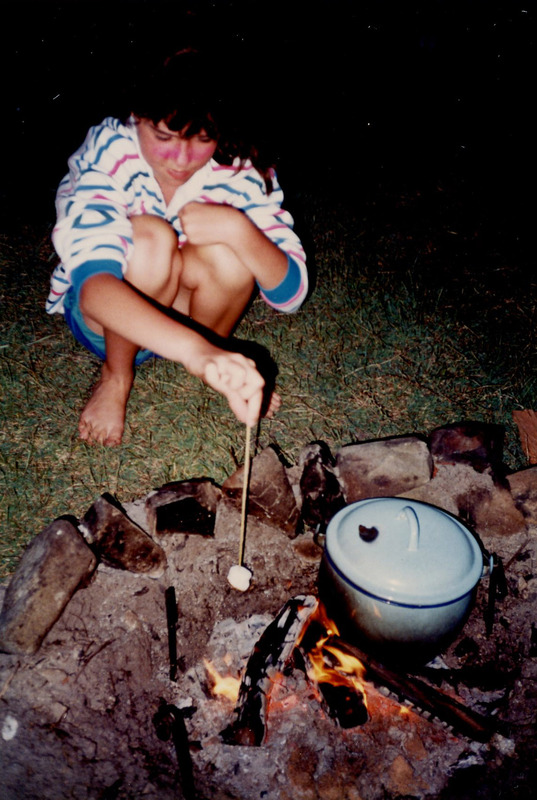 The caption on this says “our first (solo) camping weekend, Lamington NP, Anzac weekend 1985”. Both tents are ours. One of our other favourite sites was at Lamington National Park where we’d see the bower birds, noisy pitta birds, rosellas and possums. It could get quite cold up there so we had some fun times rugged to our eyebrows, toasting marshmallows and playing maj jong or card games. 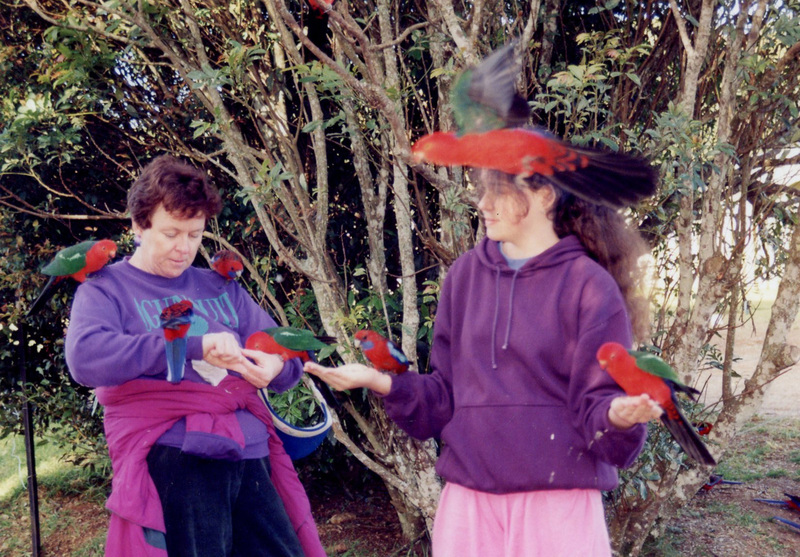 During the day we’d go for walks in the magnificent rainforest, and perhaps feed more birds. And then there was the year I decided on the spur of the moment one school holidays to take DD3 and her cousin to the snow, a mere 1500kms or so away, as I’d heard there’d been great snowfalls. By the time we arrived at a motel after dark that night I was seriously doubting my sanity, especially as the motel seemed to have a high turnover of short term stays and a lot of cars coming and going! Once we reached Kosciuszko National Park, we camped below the snowline but believe me it was pretty cold just the same. The wildlife had grown accustomed to the campers so were on the lookout for snacks, like these two fellows. An improvement on our Bicentennial camping trip when the birds had eaten all our stone-fruit which we’d foolishly left on the table under the tent’s awning. When we returned the chairs were covered in the way you might expect when a critter has eaten a surfeit of stone fruit. But it’s cold and we need a snack! 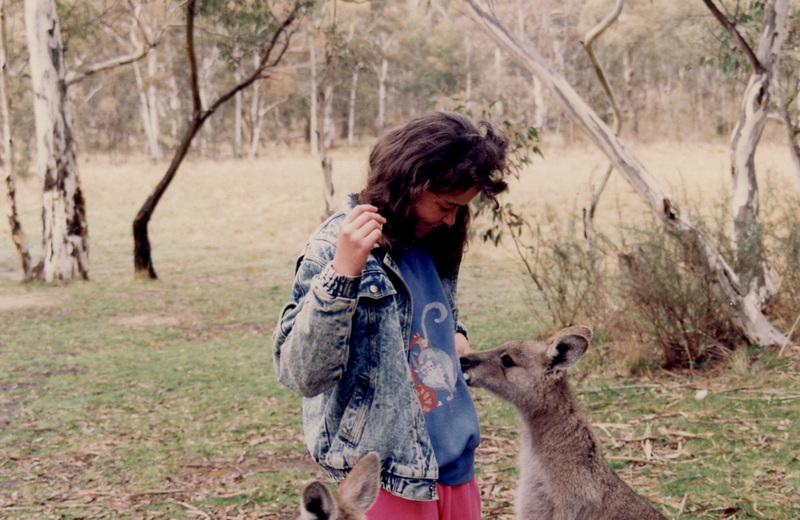 Although it didn’t make the front page news, I regard my Big Trip of 1994 as my most memorable. Exhausted and burnt out from a high-intensity, very political job at a research centre it was time to take myself to the wilderness for a while (have I mentioned what a supportive husband I have?). So me, my tent and all my clutter took off in the car for points south of Queensland. That raised bonnet suggests trouble was already afoot. Mt Kaputar National Park. My first stop was Mt Kaputar where I arrived late in the afternoon. I got set up and made sure my brick-sized mobile phone was charged and checked in with himself. In the process I turned the car engine – and again – and again…to no avail. In the morning I got someone to jump start the car and made my way determinedly down the range to the nearest town, where I foolishly turned the engine off again. One day into my trip I had acquired a faulty alternator so I spent my second day cooling my heels in a country town waiting for it to be replaced. 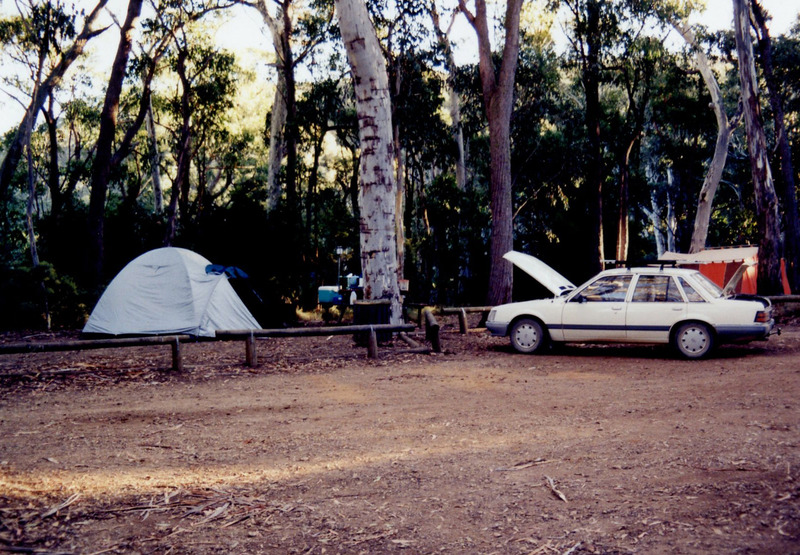 Once again Hastings Pt 1989, but could be any/many of our campsites. Mercifully after that the trip went smoothly and I dawdled my way to Adelaide (I guess about 3000kms away) a couple of weeks later. While I often found myself camped with only a few other tents around, I also wasn’t being foolish. At one national park I got such a negative vibe that I just turned turkey and found a motel. Mr Cassmob met me in Adelaide and we picked up DD2 and DD3 from the airport in Alice Springs, late as it happens, but that’s another story. This was our first excursion into the Northern Territory and little did we know then how big a part it would come to play in all our lives over the coming decades. By the time we pulled back into our driveway in Brisbane we’d notched up about 14,000kms and spent more than half the time under canvas. At the time of the Bicentenary in 1988, submissions were sought from people around the country showing their favourite places and activities. We submitted this one of DD2 washing her sister’s hair, camping style. Two of the Cass girls, Hastings Point. Page 272, My Australia, Robertsbridge Group Pty Ltd, Sydney, 1989. As you can see, camping has been a large part of our family story over several decades. We don’t get to do it as much lately – sleeping on the ground has worn off a little, but there is something very special about being out in the bush with a blur of the Milky Way over your head. The family cycle has turned and now our children and grandchildren love to escape the big smoke and head out to enjoy the nights away as a clan with glo-sticks, sparklers, marshmellows and a roaring fire. It is certainly creating some great cousin memories which will stay with them through their lives. A souvenir photo, taken by one of the kids, when my parents came camping. 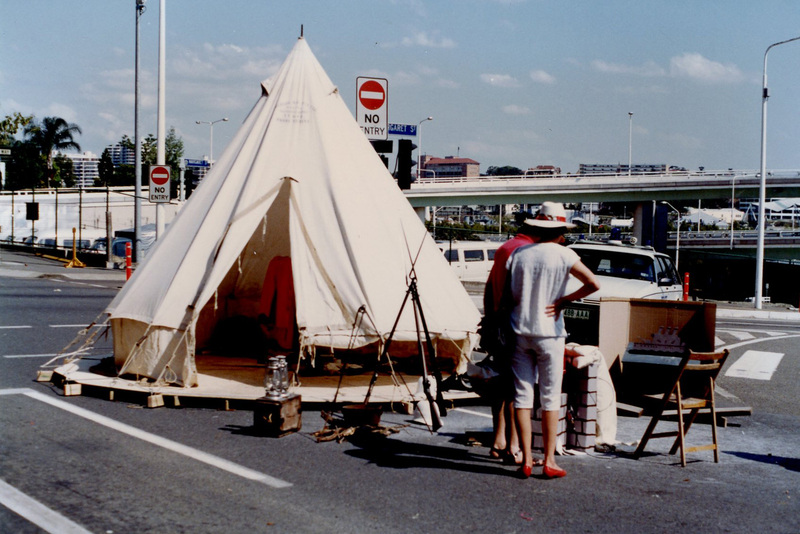 And as a finale, here’s a photo of an old-style tent taken at the Colonial Queensland exhibition in Brisbane in 1986. It was at this event that I enquired about family history research and signed up with the Genealogical Society of Queensland, thereby starting me down a path which has kept me engaged and happy for nearly thirty years. Now you’ve reached the end of this saga, why not head over to see what the other Sepians have had to say about camping or trios. It looks like it’s been a popular topic. Did you go camping as a child? As an adult? Did you love it or loathe it? This entry was posted in Cass family history, Sepia Saturday, Travel and tagged camping, Hastings Point, Sepia Saturday by cassmob. Bookmark the permalink. Great story! 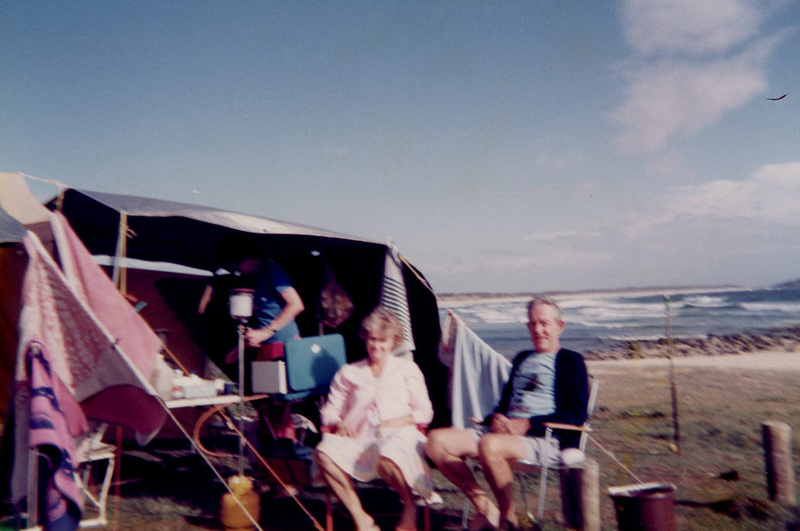 It was lovely to hear how camping has been a part of your life right through the generations. We’ve had lots of fun on our camping expeditions Chris. I camped as a Girl Scout and as a scout leader. On my last camping trip, I woke up when water seeped into my sleeping bag. Yep — RAIN. Hard rain. There was no way to get breakfast, so we grabbed our stuff and headed home. Cleaning that sleeping bag was the worst. But had I ever had to wash my hair in a bucket, I wouldn’t have gotten this far in my camping career! That happened to us last Christmas. The tent hadn’t been used for some time and in the heavy rain it leaked! Not such a nice way to wake up Christmas morning! What a horrid way to start Christmas Day Sharon. would surely have put a dampened on things. Did you manage to regroup? Yuk, a wet sleeping bag is not pleasant Wendy and sometimes you just have to give it away while you’re not too far behind. I can remember a couple of very wet nights. I rather think DD1 thought it was pleasant to have her sister wash her hair…sort of like the hairdresser’s but with her head tipped forward not back. there were no showers at this camp,site apart from one or two out in the open. I do admire a family which embraces the camping holiday. You’ve certainly had some adventures! To be honest Little Nell I hadn’t realised the extent of them until I started and could add more, like the time that in bare feet (stupidity!) while looking for firewood my toes were about six inches from a mercifully sleepy death adder in the sand dunes….before that I hadn’t even known it was their habitat. lesson learned, after that I made sure I wore shoes while wood collecting. The front page! I just adore that. What a wonderful camping-adventurous post to share. Thanks Karen…it surely got me some notoriety in my new rather large high school. What wonderful memories, which have inspired memories for me too. We grew up with camping. I was also a Brownie and a Girl Guide). Somewhere I have photos of erecting a tent as part of obtaining a camping badge. We also needed to do orienteering (which I loved) and had two matches to light a fire. I remember the first match went out and then the second took a long time to catch (and some gentle blowing) but the campfire was lit and I got my badge! I am now off to read more about your adventure. I had a good chuckle when I read your words of camping wisdom…lessons we’ve all learned at some stage. Yes, an omission on both that I hasn’t noticed in my debate about whether to include it…I am second from the left. Camping has never been a pastime that we’ve embraced. My one and only trip with a friend’s boys and out sons proved an unmitigated disaster. The North Sea is not as attractive as your Pacific coast. can’t say I blame you Bob…the North Dea would be a decidedly chilly and windy option. That’s a new one on me Genepenn…losing your way back in the dark…scary stuff! Also hadn’t heard of using the radiator like that. You did remind me of when DD2 had a possum try to climb up her back mid-pee in the middle of the night at a bush camp…She didn’t even scream even though she was about 10. Great read, your enthusiasm for camping shines through. Quite a few Sepians picked up on a tent theme this weekend, and you’re certainly a top competitor for the number of camping stories.Though I have my own share of camping tales, nowadays I prefer primitive moteling. Fewer death adders. Yes it seems like Sepians are great camping adventurers Mike. I prefer luxury accommodation but I can’t say it happens all the time 😉 I’d stay away from death adders if I were you. No, that’s a new one to me…I’d have been quite scandalised back in my naive and innocent youth! Okay, the eels and water snakes stopped me in my tracks. I do remember going camping with my folks and my aunt and uncle back in the mid-60s. We all slept on the ground in sleeping bags with air mattresses. No tent. When we awoke in the morning we discovered cow hoof marks all around us. I mean ALL AROUND US. They’d somehow walked between us during the night and none of us woke up. That’s a good thing. i think if I’d have awakened to a huge cow standing over me my scream might have started a stampede. I laughed out loud at that story – I would have been a tad disconcerted too! HOw funny. I never went camping with my family, but I did quite a bit of camping with scouts and other groups. I enjoyed it and wish I had done more. Now it has been nearly 40 years since I have gone camping and I don’t feel like doing it again. I know what you mean postcardy. I think if our friends hadn’t invited us we might never have made the transition and now the children and grandchildren are carrying on the tradition. At my age I can only say camping is for kids. There are times when camping suits the littlies better.